DEC's Hudson River Estuary Program staff and volunteers counted the first 'glass eels' of the season in the Saw Mill River in Yonkers on March 1st, and since then, eels have been showing up at Hudson River sampling sites farther north. The American eel (Anguilla rostrata), a migratory fish, is hatched in the Sargasso Sea and enters North American estuaries, including the Hudson River, as tiny, see-through 'glass eels' each spring. The name 'glass eel' describes the fishes' lack of pigment and near transparency. The species is in decline over much of its range, and we need baseline studies for conservation. 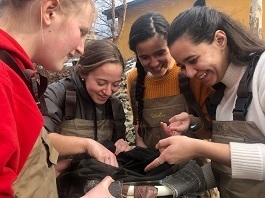 Now in its 12th year, the Hudson River Eel Project recruits teams of scientists, students, and community members to collect glass eels using specialized nets and traps (fyke nets and eel 'mops') on Hudson River tributaries each spring. Volunteers count the juvenile fish one-by-one, weigh them in groups, and release them to habitat upstream, often above dams. We also collect and record water temperature and water-quality data. The Hudson River American Eel Research Project coordinators need volunteers to help monitor these juvenile glass eels as they enter the freshwater tributaries of the Hudson. For more information, visit DEC's aidan.mabey at the Hudson River National Estuarine Research Reserve. Watch a video clip about Hudson River Eel Project. The Hudson River American Eel Research Project is coordinated by DEC's Hudson River Estuary Program and the Hudson River National Estuarine Research Reserve, in partnership with the New York State Water Resources Institute at Cornell University.